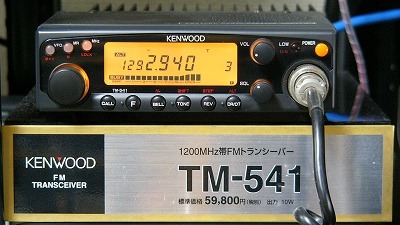 Kenwood TM-541 series provides great capability. There are 20 memory channels plus 1 call channel, and all can be used to store transmit and receive frequencies as well as repeater and signaling data. The TM-541A transmits on 2 meters with three output power levels: 5/10/50 watts. Extended receive allows reception from 118 to 174 MHz. New features include Dual Tone Squelch and pager functions. You also get auto-power off, built-in CTCSS encode, time-out timer, auto repeater offset and easy to read LCD. The Kenwood TM-441A transmits on 440 MHz with three output power levels: 5/10/35 watts. The Kenwood TM-541A transmits on 1200 MHz with 1/10 watts. The TM-541A features ALT - Automatic Lock Tuning to compensate for frequency drift.